Hi guys! I told ya I’d get something else for you, and here we are! Now some of you may recall that one of my fav movies is Woodstock—the documentary from the history making music/people festival on August 15-17th, 1969. Well, in about 2 weeks it will be 40 years since the event. 40 years!! OMG! Blows my mind. So anyway, I’ve been in a flashback, flower-child mode these days and decided to create a celebratory set for the occassion. I realize that the intro title graphic at the top of this page may not interest you for your site, but I just had to do that, in honor of Jimi, Janice, Jim... and countless others who have passed on since Woodstock happened. Ok then.. lotsa goodies to share. Few links n’ stuff regarding this set. The font used on the buttons has been around quite awhile. It’s called “Bell Bottom Laser” and one place you can download it for free is here. Another hippie-type font that I’ve used for this type of design is Inkwell. Freebie here. I have also used Mojo, Jojo & Jonah, all of which you can find at MyFonts ($). This set was a lot of fun to create! A-N-D I even had Woodstock playing in the background! OH, speaking of, did you know there’s a new Woodstock movie premiering on Aug. 28th, called Taking Woodstock. Go visit the site, it’s pretty cool. And check this out... Isn’t that funny (photoposter of moi)? There’s an area of their site where you can make your own *Psychedelic* poster. I was 15 when Woodstock happened, but of course all of my little hippie friends and I talked about it all of the time, it was a little flower-child’s dream to go to something like that. Let’s see, there was a couple of other things I was going to tell you... OH, see up on that “Happy Anniversay” header up above? The graphic in the lower left corner with the swirly & white dots? I downloaded that from DryIcons. They have TONS of free downloads of vectors & icons, some pretty cool stuff. Another site I was browsing through (and downloading!) was DaPino. She also has oodles of vector graphics to download for nada. You are required to register first, but it’s no big deal. I didn’t use anything of hers for this set, but it’s a cool place to visit. :::Yawn::: sleepy. You know how I mentioned that I have been in this Flower-child mode thse days? I just redesigned my blog rather flippy too. Fun. Dang, I’ve been sooo thirsty but haven’t felt like getting up to get some more water. geesh... be right back... Ok, ahh, much better. OH, another little surprise for you - I made a desktop of this design too. woo-woo. Hey! Gotta tell you about a new client site that I just finished. Dr. Fitness & the Fat Guy. They rock! There’s tons of info about exercise, eating, wellness... they have popular guests on their radio show A-L-L of the time, such as Hungry-Girl Lisa Lillien, Jillian, the trainer from the Biggest Loser, Kathy Smith—the list is endless. I just want to pimp their site because they do so much and I don’t think that many people know about it! Gotta check it out, k? OK. Gotta go. I hope you enjoy the goodies today. 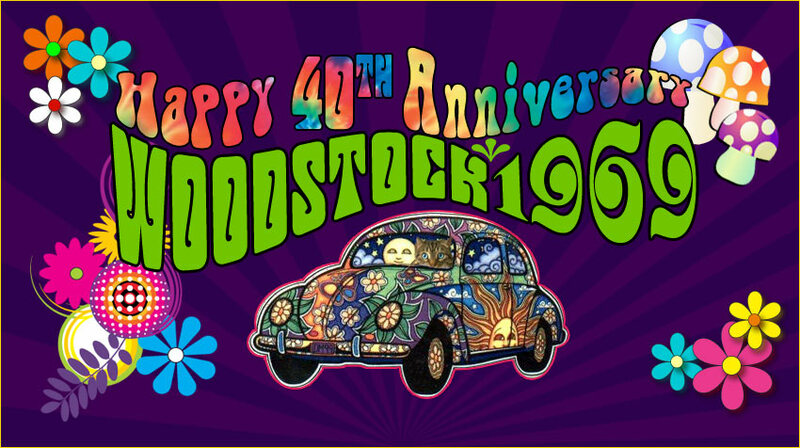 Celebrate the Woodstock Anniversary! Dance in the mud and wear flowers in your hair!